You amaze me with your ability to transport yourself into the highs and lows of the experience and life of this bee. Such a wonderful gift! I have to read it again. I am so concerned about the bees, too. When I swim and find little bees floating on the surface of the pool, I transfer each one to a leaf and bring it out of the pool onto the rim. Sometimes they dry out and fly again. I always pray for them! I cried last summer when the landscapers in this complex took down two-thirds of the beautiful, tall trees here. We used to have wonderful singing birds of so many species and we had butterflies everywhere. I almost never hear a bird singing now. Simultaneously, some mealy bug infestation took out all our hibiscus trees that used to attract hummingbirds. Sad not to have those hummingbirds visiting us anymore. The management of our condominiums thought because of the drought, we shouldn’t be watering so many trees. Now we have had more rainfall in January and February of 2017 than we had in all of 2017. God was taking care of things, but some people lost faith beforehand. Too bad about that. 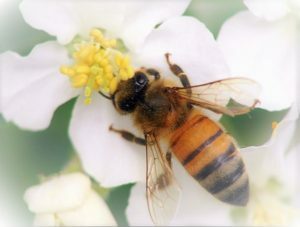 Let’s keep the faith for our bees! I meant to write more rainfall in January and February of 2017 than we had in all of 2016. Oh my goodness, I miss you too!! Sending all my love!! !